U. S. household incomes soared in 2015, recording biggest gain in decades……… The data represents the clearest evidence to date that the nation’s long, slow and topsy-turvy economic recovery has finally begun to deliver prosperity for wide swaths of workers. 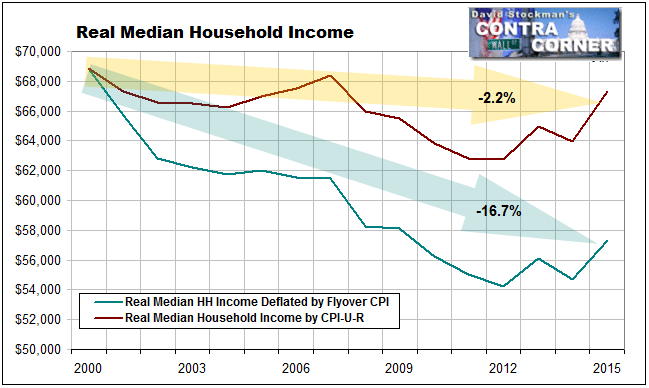 The self-evident fact is that the median household couldn’t have had an after-inflation income gain of 5.2% in 2015. There is not a single data point in the mountains of ‘incoming’ economic data that is consistent with that proposition. Yet nothing in the Post story, or any other mainstream coverage, even hints that the Census Bureau’s whopper isn’t on the level. This post was published at David Stockmans Contra Corner by David Stockman ‘ September 20, 2016.